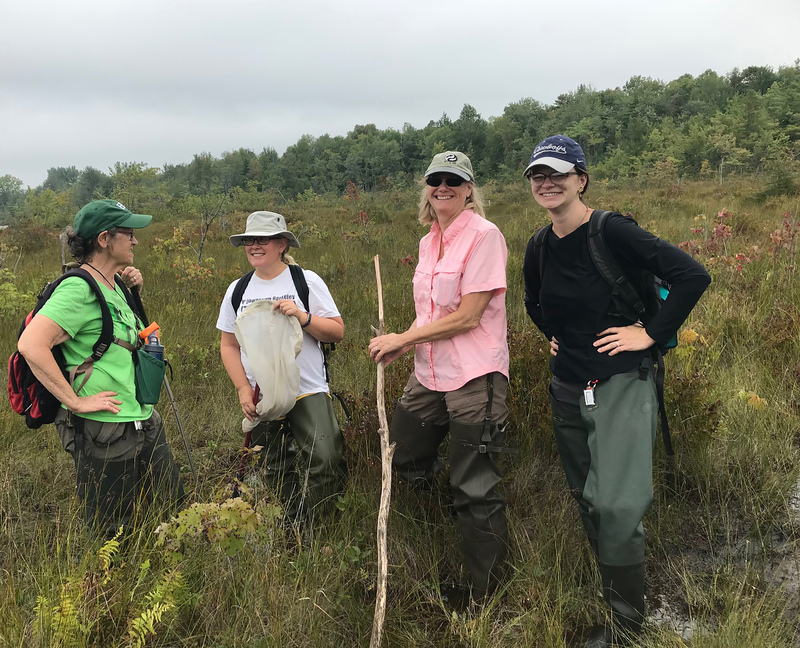 Among the scientists working to monitor and protect environmentally sensitive Oswego County habitats for threatened species are (from left) Sandra Bonanno, an independent ecologist formerly with The Nature Conservancy; Karen Sime, associate professor of biological sciences at SUNY Oswego; Sandra Doran of the New York Field Office of the U.S. Fish and Wildlife Service, who is project manager on Great Lakes Restoration Initiative grants led by SUNY Oswego biological sciences professor Peter Rosenbaum (not pictured); and Chelsea Springs, a May 2018 graduate of SUNY Oswego working for Sime and Bonanno in conjunction with an Environmental Benefit Fund project. OSWEGO — SUNY Oswego faculty and student scientists working to monitor and protect an environmentally sensitive Oswego County habitat of endangered species also plan to work with the Oswego County Soil and Water Conservation District to hold neighborhood education sessions about how people can alleviate some of the threats. “We want residents of the area to understand there are things they can do to reduce their impact on the environment,” said SUNY Oswego professor Peter Rosenbaum, lead investigator on a series of projects to monitor and mitigate threats to a fen that is home to rare species, their favored habitats and, increasingly, invasive species. Fens are marshy peat lands with a near-surface water table; groundwater and surface runoff keep them wet. The county’s Soil and Water Conservation District administers a $150,000 Environmental Benefit Fund created by the state Department of Environmental Conservation to benefit these rare habitats and the threatened species. The fund supports five research projects and one education program. Investigators include biological sciences faculty members Richard Back, Eric Hellquist, Karen Sime and Rosenbaum, as well as independent ecologist Sandra Bonanno. Kasey Barber, a senior zoology major at SUNY Oswego, is among those assisting Rosenbaum with a turtle census at the Oswego County site. Back and Hellquist are engaged in water quality monitoring, while Sime awaits a hoped-for return of protected moths in order to collect data on a parasite of the species. Back said he traveled to the site for two days every couple of weeks, working with SUNY Oswego biology majors Jovine Neita and Linden Merrill to collect water samples and then analyze them for dissolved compounds of chlorine, potassium and calcium. Samples also were sent to the University of Michigan for analysis of phosphates and nitrates in the water. In addition to studying sensitive habitats and animals, the Soil and Water Conservation District will hold education sessions to teach neighboring residents and businesspeople about the sources threatening the sensitive habitats, such as septic drain fields and fertilizers that are within neighbors’ ability to control. Phosphates, for example, stimulate growth of plant species — such as cattails and certain kinds of algae — that can disrupt the food web for animal inhabitants, Back said. Rosenbaum said agencies of the federal, state and county governments have cooperated closely to mitigate threats to the fen — there are now grants totaling $350,000 to study and protect the site. As an example of such cooperation, thanks to U.S. Fish and Wildlife Service funding, the Bronx Zoo/Wildlife Conservation Society sent a team of veterinarians last year to test species for reptile and amphibian diseases. “They issued a clean bill of health,” Rosenbaum said.